The Custom-Flex Door comes with 4 different bins and accessories so you can customize your door. It includes the dairy bin, and a large, medium and small bin. Make room for taller items like milk, juice and soda. The shelf offers 3 different ways to organize - it flips up, slides under the back half of the shelf, or can remain pulled out like a traditional shelf. 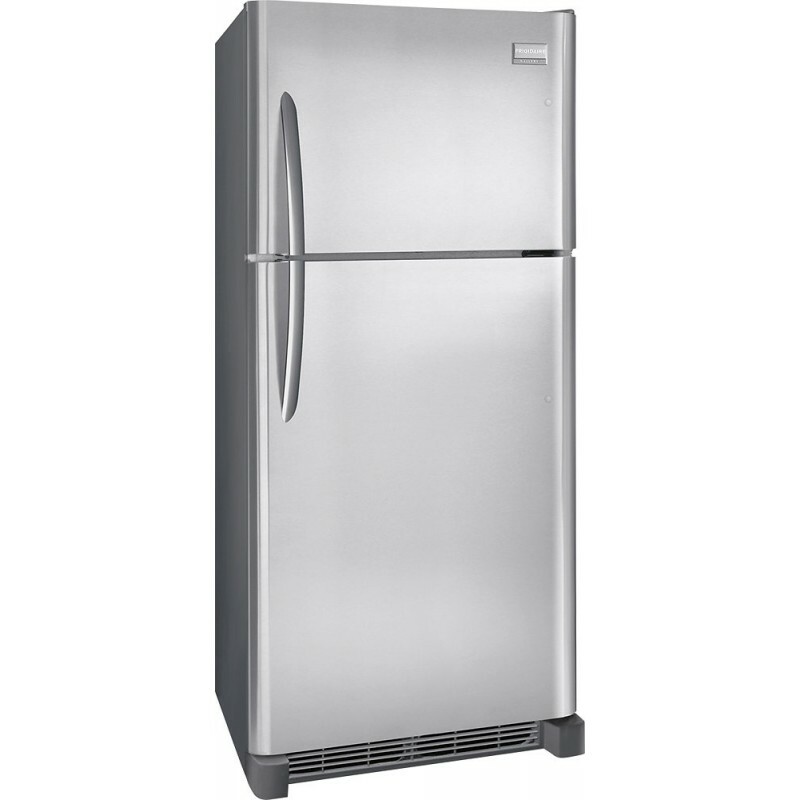 The refrigerator is ice-ready so you have the flexibility to easily add an ice maker later if you decide you want one. Conveniently located in the fresh food compartment for easy access to sandwich foods. 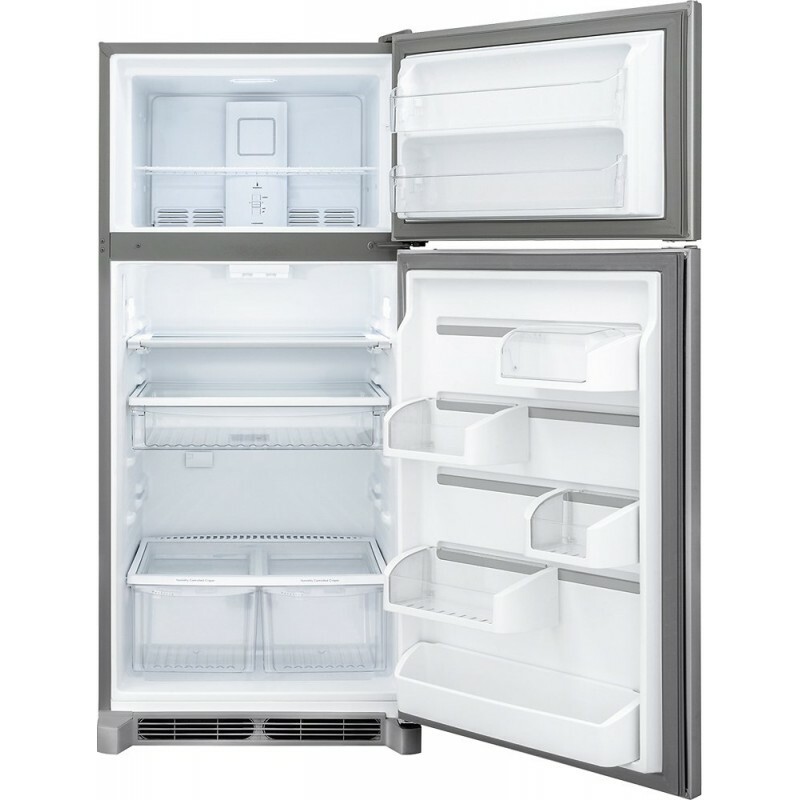 This top-freezer fridge offers the flexibility to work in your home or in your garage. It's built to handle extreme temperature conditions. 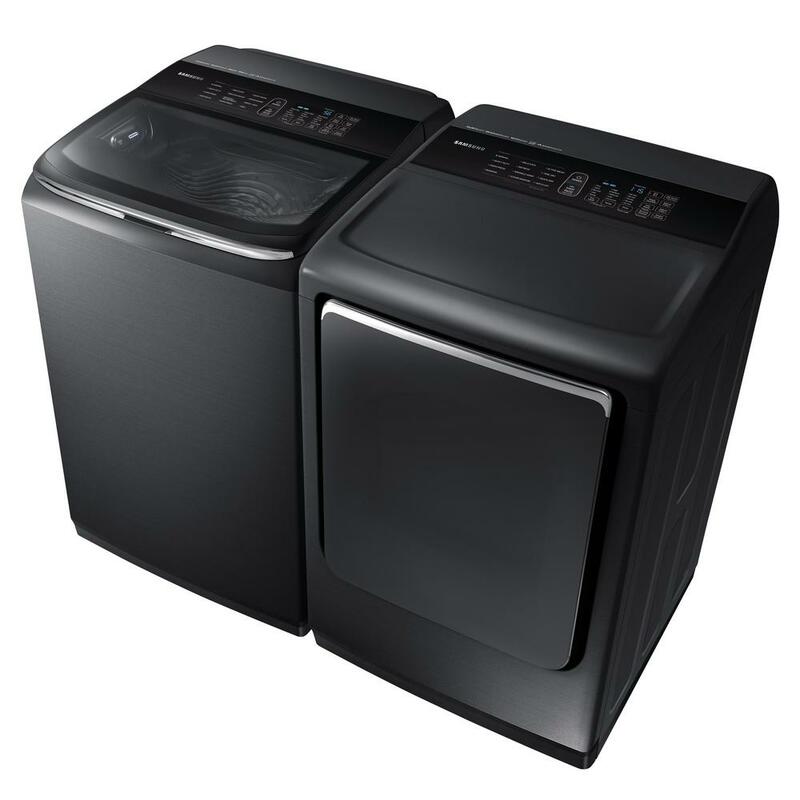 Maximize your energy and dollar savings with Energy Star Qualified Appliances. With accessible shelving, and controls that are positioned within arm's reach and allow one-hand operation, this top-freezer refrigerator is A.D.A. Compliant. No nonsense refrigerator! I had some drama on delivery, but the refrigerator itself is a no nonsense unit. Nothing fancy, but very practical. Great Frigidaire refrigerator! This Frigidaire refrigerator is full of wonderful features. With the smudge proof stainless steel exterior and beautiful design it looks great too. Plus it is Energy Star rated. Good price for highly rated refrigerator This time after the replacement refrigerator was delivered and the door hinge was switched to the left side by the deliveryman the door gaskets looked like they would seal properly and the top and bottom doors lined up better. It would have been great if the door hinge could be ordered on the left from the factory. I think the freezer should have basic ice cube trays/bin included even if the optional ice maker is not ordered. Good price for highly rated refrigerator I bought this refrigerator because it was highly rated by a consumer magazine. Best Buy had a great price for it with free delivery. When delivery came the hinge was on the right side and I asked the deliveryman to change the hinge to the left side. After that the top and bottom doors and the gaskets did not line up, which I pointed out to the deliveryman who said to wait a couple days for the gaskets to "relax". After a couple days the doors still did not line up. 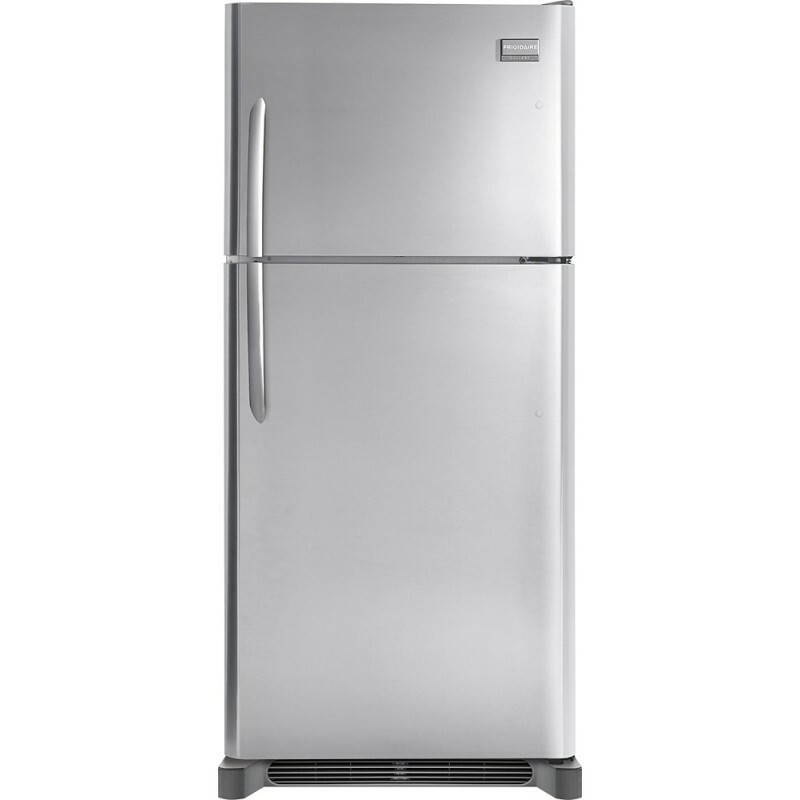 I called Best Buy who, said they would order another refrigerator with factory installed hinges on the left. After multiple missed delivery attempts, the next refrigerator came with the hinges on the right too, but the deliveryman changed them to the left and this time the doors and gaskets lined up acceptably. The deliveryman was unfamiliar with the leveling procedure but with my help we got it leveled OK with my cell phone application. I did not buy the icemaker option however I think the freezer should have come with ice cube trays.